Sun shine. Ice cream. Friends. Laughter. And special memories to be created. Ice Cream Party is a great way to celebrate summer. 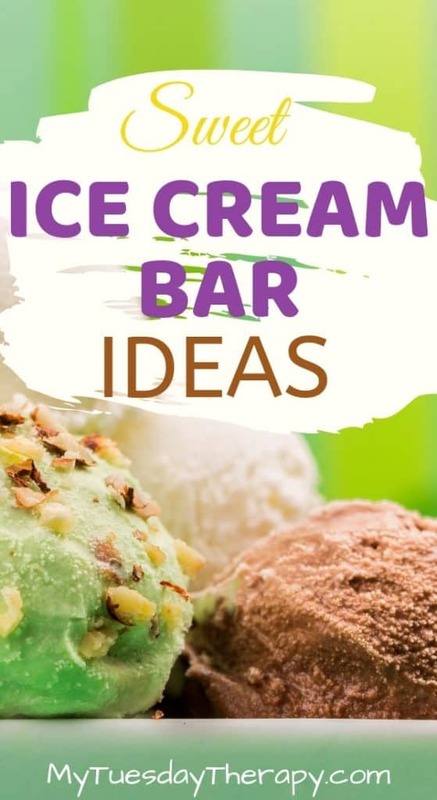 Check out these cool ice cream bar ideas, ice cream party decorations and activities for younger and older kids! I’m sure adults would enjoy them too! This post contains affiliate links. If you choose to buy via these links, I will get a small percentage at no extra cost to you. Thank you! I host an annual ice cream social for my girls and their friends. We usually have almost twenty ladies here playing games, making sundaes at the ice cream bar and most importantly enjoying each other’s company. I don’t usually have any specific theme for the party besides choosing colors but you could, of course, have a princess, unicorn, mermaid, fairy, pirate, Harry Potter or any other theme you can think of. Color themes are easy but also cute! You never go wrong using pastel colors. Those seem to be the popular colors for ice cream parlors. Invite your friends and family over to celebrate with you and to enjoy ice cream sundaes. 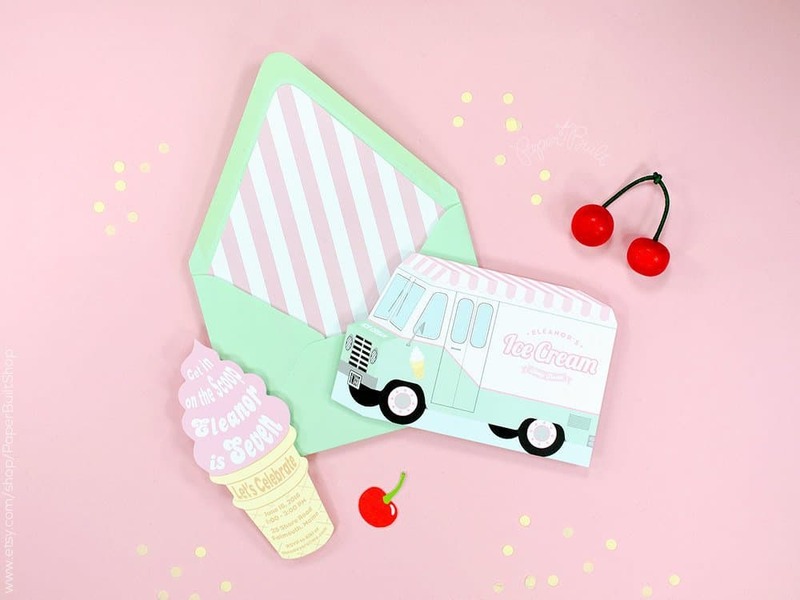 Get the adorable, editable ice cream party invitation from Little Rose Studio. Just edit, print and send. 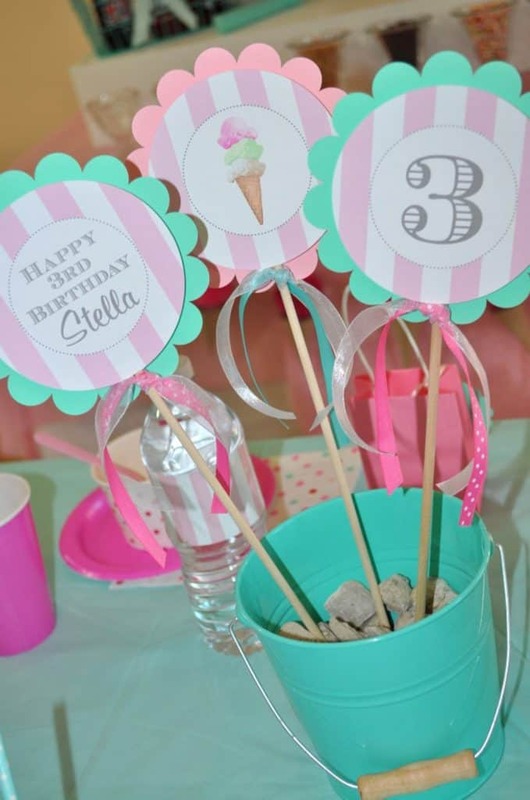 Sweet pastel colors are perfect for an ice cream birthday party! 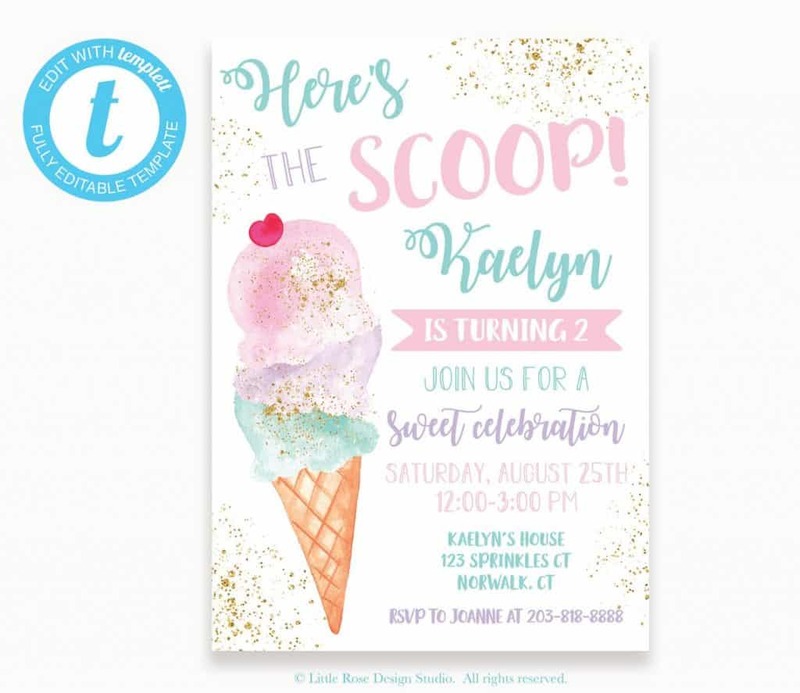 A fun customized ice cream party invitation from Paper Built Shop makes sending invitations easy. Your guests will be delighted to receive this cute set! This party is gonna be sweet! These ice cream social decorations are pretty awesome! 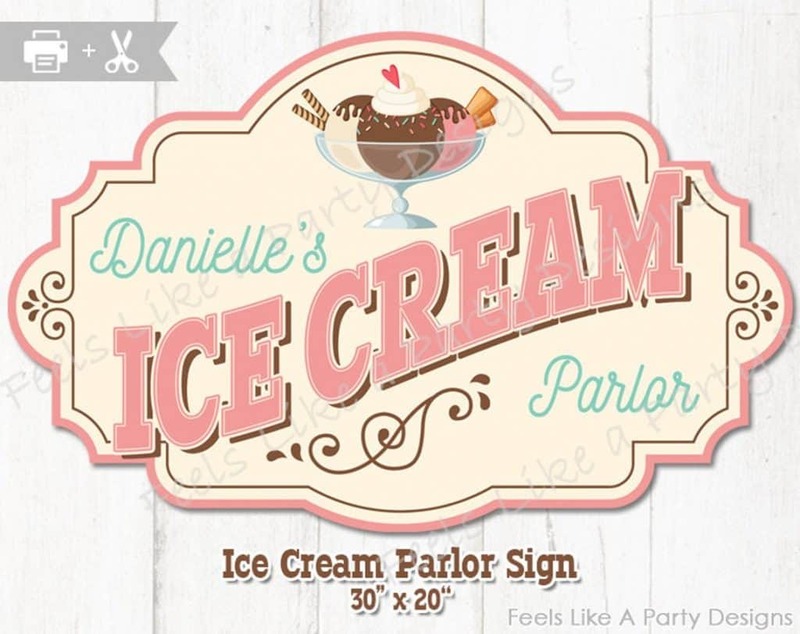 Welcome the guests to the ice cream party with a sweet vintage ice cream parlor sign from Feels Like A Party. This is a pretty good size sign you can put on the door or above the ice cream bar. If you prefer the chalkboard look you might like this ice cream party sign from Squishy Designs by Me. Make ice cream cones from cardboard and construction paper. The big scone is 19″ tall and 13 1/2 wide.. The scoops are 7 1/2″ in diameter. The little scoops are 3″ in diameter and the scones are 5″ wide and 6 1/2″ tall. Hang up 20″ honeycomb ice cream cones from Lou and Pepper Parties above the ice cream bar or the seating area. The cones come in various colors so you can create the look you want for your ice cream birthday party! Add a few smaller honeycomb ice cream cones for variety. Get an inexpensive set of three 8″ cones from Amazon. You could also create a cute ice cream party centerpiece with these cones. Place them in mason jars, tie tulle and ribbon around the jar. Or use hot glue to attach the cones to a circle cardboard or a plate. A sweetest ice cream cone centerpiece from Baskets From A to Z shipped to your door. A delightful decoration to be placed on the birthday girl’s table. She will adore this! Mason jars are handy for any party and an ice cream party is no exception. 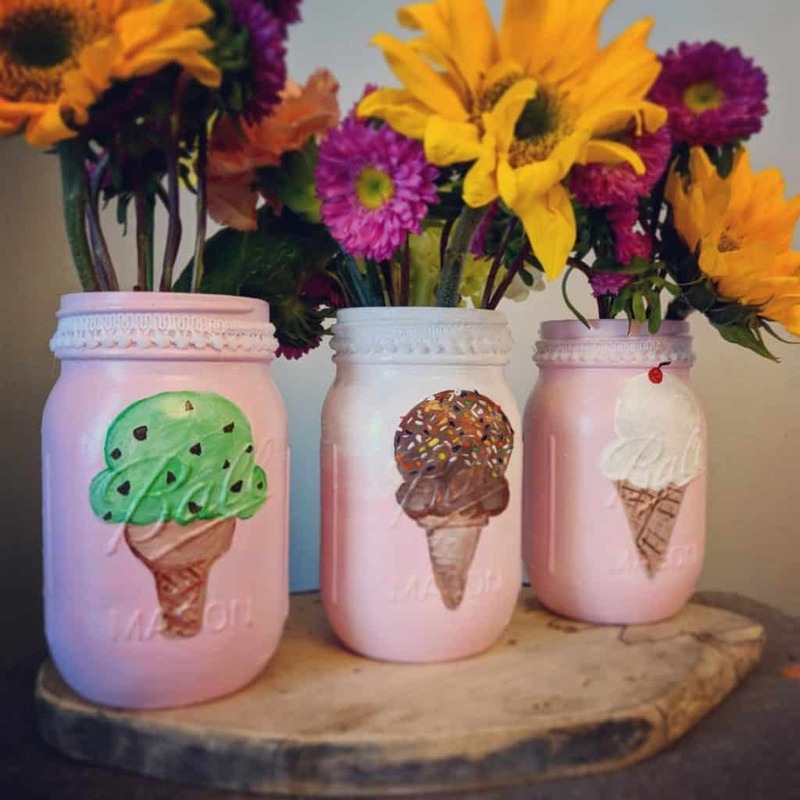 Get custom made ice cream mason jars from Lovely Lucia Boutique and use them in various ways at the ice cream social. They make awesome centerpieces filled with flowers. You could also use them at the ice cream bar for holding spoons, straws or napkins. If you are into DIY projects this would be a fun decoration you can make yourself. With mason jars, paint and ribbon you can create perfect mason jar centerpieces. Buy Chalky Finish paint from Amazon. Since you are having an ice cream party, you probably will buy ice cream waffle cones. They aren’t only great for ice cream scoops but also for creating ice cream party decorations. For example buy silk flowers and put them in ice cream cones. Looks pretty cool. Make it even sweeter by inserting the whole thing in a glass cylinder vase. You can order those from DollarTree. You can get waffle bowls for next to nothing. Get a box of them and use them to make fun centerpieces. Fill up waffle bowls with flowers or tissue paper ice cream scoops. 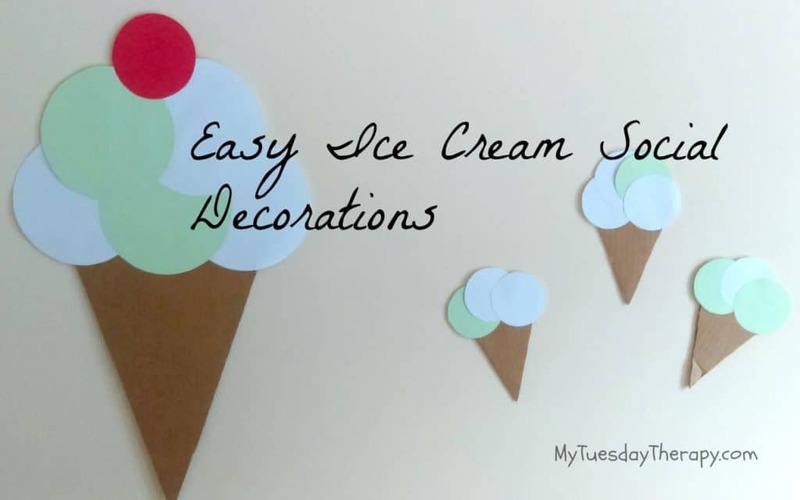 A cute cheap ice cream party decoration. What a fun photo backdrop! Your birthday star and guests will have a splendid time taking pictures in front of this ice cream parlor backdrop from Photo Prop Floors Drops. The backdrop comes in various sizes and won’t break the bank either. Set a bar table and chairs in front of the backdrop for taking sweet pictures. The backdrop will make the kids want to go in the parlor! 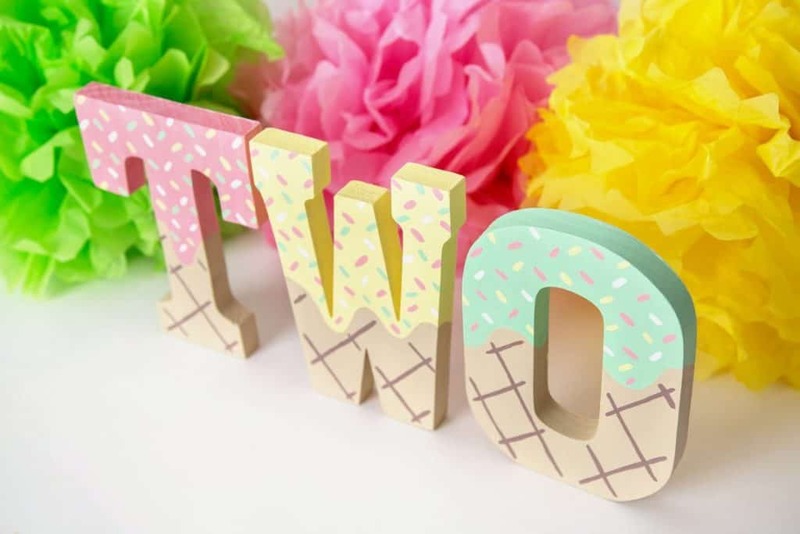 Beautiful “ice cream” wooden letters to be displayed at the ice cream birthday party. Use them as a photo prop when taking pictures of your little one. Order any letters to spell the age or name. The wooden letters from Chalkboards of Atlanta are predrilled in the back so you can hang them on the wall. A sweet keepsake for your child’s room. I know some of you are very creative and can make your own ice cream letters! Though this photo booth is definitely not inexpensive, it could be worth the money if you host annual ice cream parties. It is handmade and painted to last year after year. 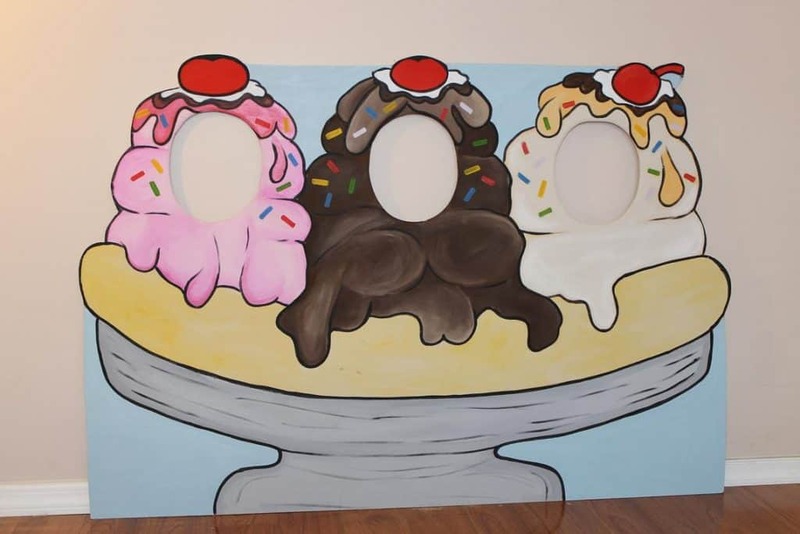 Take cute pictures with fun banana split photo booth from Little Goobers Party. This is also a fun DIY project you can make with a poster board or foam board. This ice cream truck photo booth is way cheaper than the banana split one. How thrilling it will be for the birthday star to see her name written on the truck. The kids will have a great time “sitting in the ice cream truck” and having their pictures taken. It is not only an awesome photo prop but also a great toy for a later play time. Get a customized ice cream truck from A PROper Party and let the fun begin! Imagine walking into an ice cream social and seeing ice cream cones floating around. What an easy fun way to create the sweetest atmosphere to your child’s ice cream birthday party. These inflatable ice cream cones from Amazon are 36″ tall. You can make an easy backdrop with plastic tablecloths or organza fabric. This inexpensive, beautiful rainbow organza fabric is from Amazon. With 16ft of gorgeous material you will have the most awesome backdrop! Just choose the colors to match your theme and arrange the tablecloths or curtains any way you want. You can make stunning creations with your ice cream theme colored fabric or tablecloths. 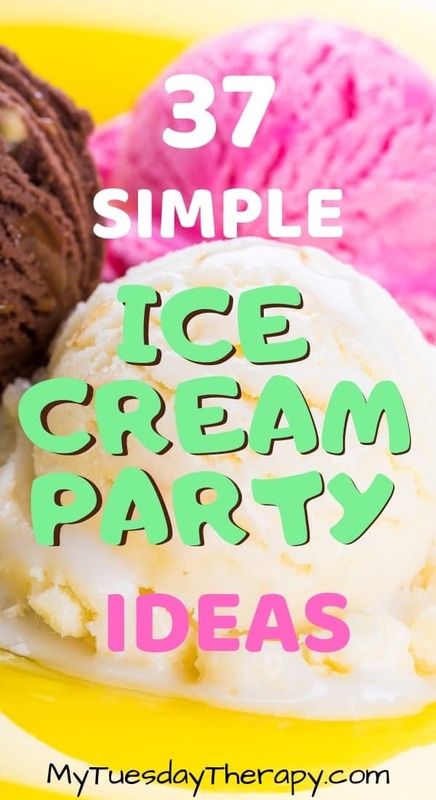 Simple ice cream party centerpiece idea! Place a centerpiece stick from So Sweet Party Shop on each table or group them together and display at the ice cream bar. They look cool in the pastel bucket. You could also put them in sundae bowls, milk shake glasses,and plastic or glass bottles. Looks like this could also be a cool ice cream party decoration DIY. 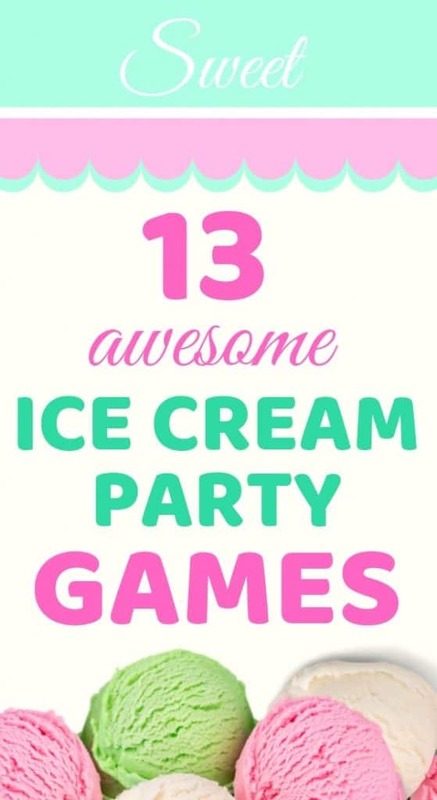 Though making sundaes at the ice cream bar is awesome your guests will be thrilled to play these fun ice cream party games. Instead of saying duck duck goose, say cherry, cherry, tomato or mint, mint, chocolate. This game is always something the little kids enjoy! 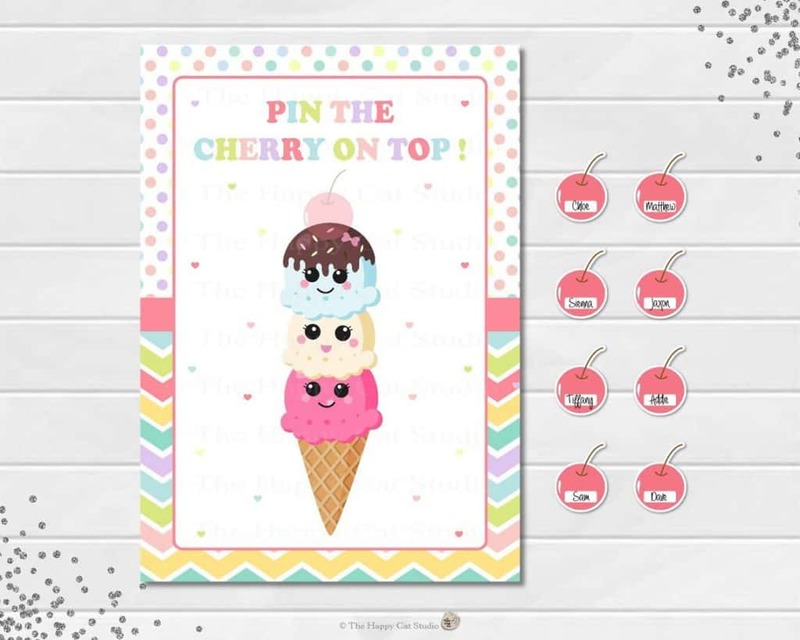 This cute ice cream poster is just what you need for playing this easy ice cream party game from the Happy Cat Studio. Ask the kids to keep the paper plate over their heads and to draw according to the instructions. All you need is ice cream cones and small balls. Play the game like you would an egg and spoon relay but using an ice cream cone and a ball. Give each guest a list of items to look for. The team members stand near a table. On the other side of the party area set up items needed for making sundaes: ice cream, scoop, bowls, spoon, various toppings. The team members take turns getting the items one at a time to make a Sundae. The team which gets the Sundae done first is the winner. Blindfold the guests and have them try various ice cream flavors and toppings and guess what they are. The one who can identify most wins. Have a ton of fun taking cool and sweet pictures with ice cream party props and the awesome backgrounds I mentioned above in the decorations. 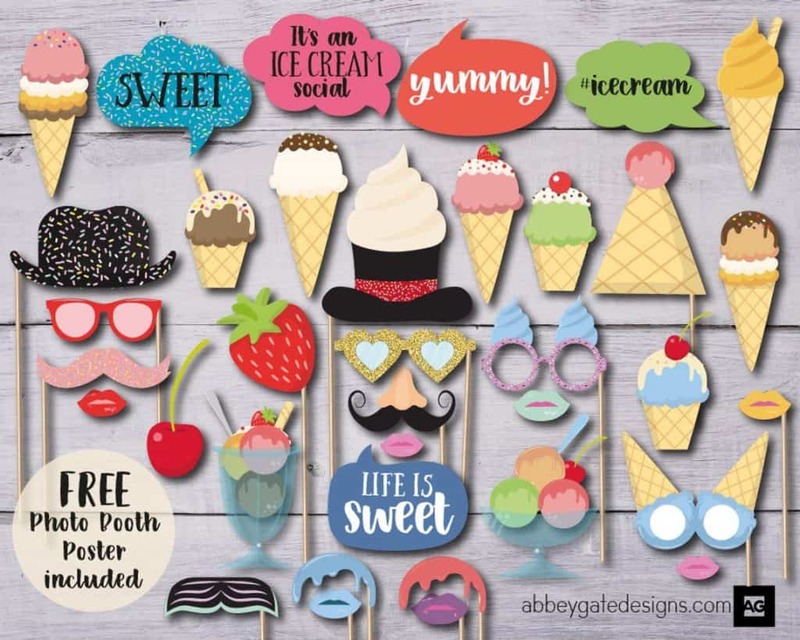 A fabulous collection of ice cream party photo props can be purchased from Abbey Gate Designs. If your ice cream party is geared towards the younger kids, you’ll love the idea of a story time. Read the story of Izzy the Ice Cream Fairy (Amazon) A delightful book that the little guests will love! This is an activity that will appeal to everyone! It is the perfect craft the guests can bring home and use for years to come! You need pretty bowls and acryclic markers. The marker set comes with baking and cooling instructions. The kids will be excited to play with this ice cream parlor at the party and after. Hours of fun! Get yours from Amazon. Imagine all the fun they can have with their very own ice cream stand! For this easy craft you’ll need flower clay pots, markers or paint and either silk flowers or tissue paper. Give each kid a flower pot. Ask them to draw or paint “waffle lines” on it. Fill the pot with flowers or tissue paper ice cream scoops. A styrofoam ball can come in handy for keeping the flowers in place. You could also make these before the party and use as centerpieces! The best thing in the ice cream party: the ice cream bar! 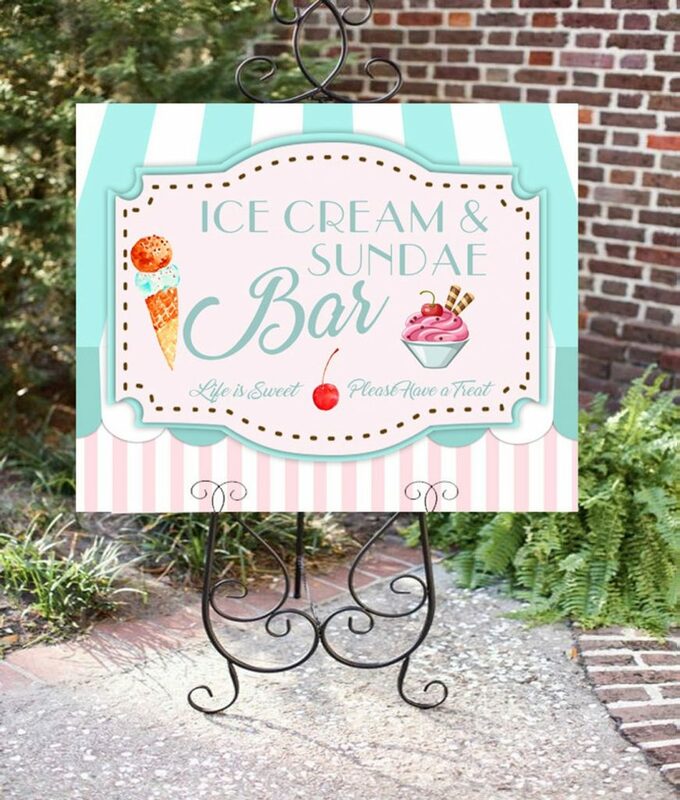 Place a cute ice cream bar sign on the counter to invite the guests to make their own sweet treats. This “life is sweet, please have a treat” sign is from Hottomatoink2. Napkin “flowers”. Roll up the napkins and put in a bowl. Adorn the ice cream bar with a Sherbet Tassel Garland. The colors on this tassel garland from Knot and Baile are awesome! Hang it in front of the sundae bar and your guests will get very hungry for ice cream. Don’t have everything flat on the table. Wrap empty cereal boxes with gift wrapping paper. Place topping bowls on top of the cereal boxes. It is a fun way to add height. Make the Sunday Bar delightful with pretty bowls, spoons and napkins. But so are glass ice cream bowls. 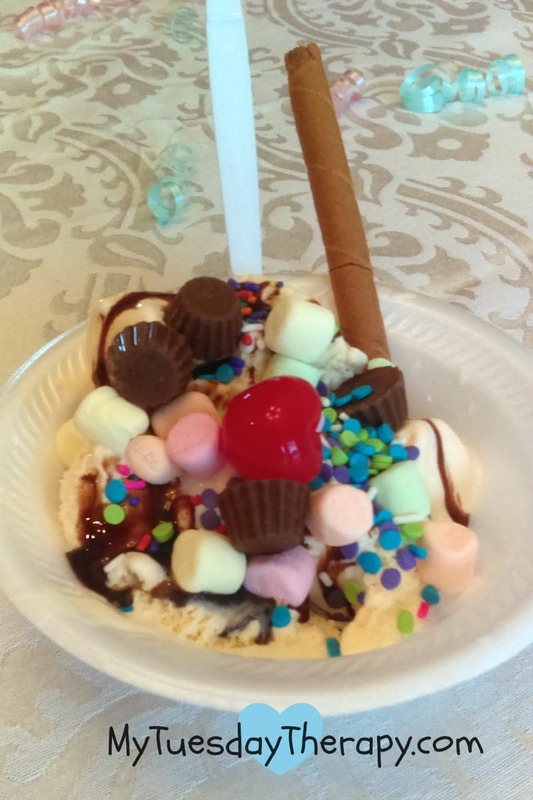 Adults and older kids appreciate ice cream served in fancy sundae bowls. Wine glasses also work well as an ice cream bowl. 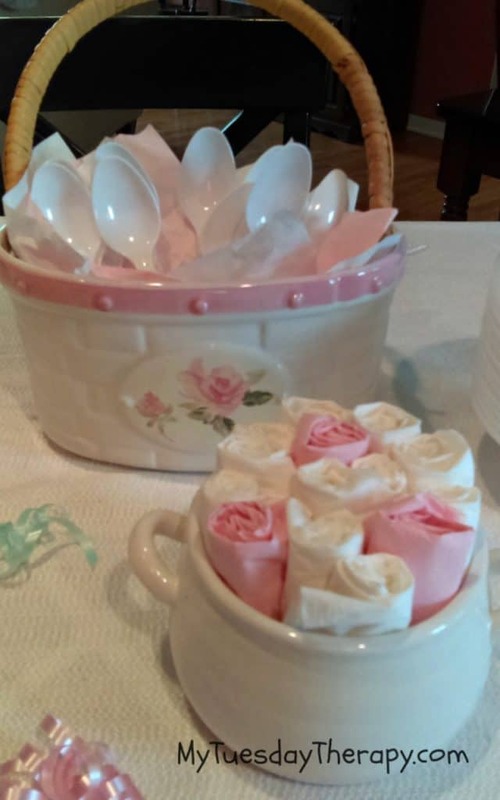 Pretty way to serve ice cream at a baby shower or bridal shower. Dollar Tree has lovely inexpensive wine glasses. They have a great variety available online: various styles, colors, stem colors. This ice cream topping list has cool traditional and awesome unique topping ideas for your ice cream bar. Serve the sundae toppings in mason jars, small bows, waffle bowls etc. Have a few soda options too for making soda floats. Chocolate dipped ice cream cones are easy to make. And they will look stunning at your ice cream bar. Melt white, milk or dark chocolate. Brush a little bit of chocolate on the inside of the cone. Dip the cone in the chocolate (1 to 2 inches). Sprinkle with crushed m&m’s, pecans, pretzels, cookie crumbs, and sprinkles. Put in an ice cream stand or a glass to dry. Your guests will devour the chocolate dipped ice cream cones! A simple ice cream stand from Amazon works well for making chocolate dipped cones and for serving ice cream. And as you can see in the picture you can fill the cones with berries too for those who for some reason don’t want to eat ice cream. 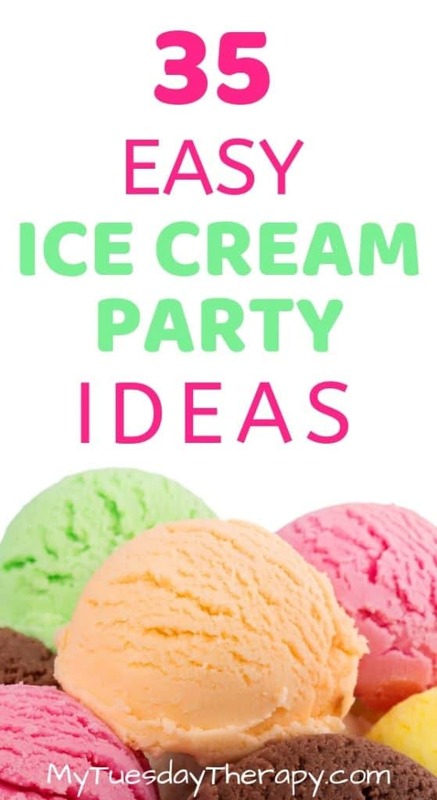 When everyone has enjoyed their ice cream creations, played the fun ice cream party games it is time for ice cream party favors. Pretty ice cream bowl and spoon filled with candy. Cute 8×8″ ice cream tote bag makes a perfect party favor. Fill it with ice cream toppings, notebooks, pens, stickers, ice cream bowls etc. This tote bag set includes 12 bags. Pretty cool deal. A set of ice cream hair ties will delight the ice cream birthday party guests! Give each guest a set or put one in the tote bag. These look too delicious to be soap! Maybe not the best favor for little kids who probably would try having a bite but older kids and adults would love these. They come in a couple of colors: neapolitan and mint. You can also get a set that has solid brown, white, and pink ice cream soaps. Buy ice cream soap favors from Seaside Soap Kitchen. Sometimes it happens. The weather does not cooperate with our plans. Bring the party inside. Put beach blankets on the floor for eating ice cream. Put coasters around the house for beverages and ice cream bowls. And do all the fun activities inside!